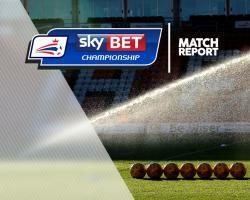 Roy Beerens scored the only goal as Reading got the better of Sky Bet Championship play-off rivals Fulham with a hard-fought 1-0 victory. The Royals went in front four minutes into the second half, when Beerens netted on the rebound after Fulham goalkeeper David Button had saved John Swift's penalty. It was Reading's 11th penalty award of the season and though six have been missed, they have followed up to score on five of the occasions. Fulham competed vigorously throughout and should have levelled in the 90th minute. But after Liam Moore had fouled Lucas Piazon in the area, Chris Martin's penalty was saved by Reading goalkeeper Ali Al Habsi. The original match on December 30 was abandoned at half time, with the score at 0-0, due to fog at Madejski Stadium. When the two teams had met at Craven Cottage earlier in the month, Fulham romped to a 5-0 victory. Fulham went into the match on a decent run of only one defeat in eight league matches, having scored at least one goal in each of their past 13 fixtures in all competitions. In contrast, Reading had lost their past three matches, including the 4-0 FA Cup defeat at Manchester United, and had not kept a clean sheet in 10 games. Neither side appeared too bothered with attacking intentions, with Reading fielding no recognised striker - though manager Jaap Stam had named four forwards on the substitutes' bench. Fulham head coach Slavisa Jokanovic went with a lone striker, Martin, in a 4-1-4-1 formation. On-loan Martin had missed the abandoned game, when in dispute with Fulham over a possible return to parent club Derby County. Even without many out-and-out frontunners, the game opened brightly, with Reading forcing the early pace. Garath McCleary escaped the offside trap but his low cross to the near post was comfortably gathered by Button. Fulham responded positively but centre back Michael Madl drove weakly at Al Habsi and midfielder Kevin McDonald sliced an effort well wide. An open contest switched quickly from end to end, with Button forced to make a fine save from Swift after the England Under-21 midfielder had been set up by Beerens. The flowing pattern continued after the break, with Reading going ahead - somewhat fortuitously - in the 49th minute. Tim Ream clumsily barged over Moore in the area and after Button had saved Swift's spot kick, Beerens drilled in on the follow-up. Though Fulham pressed hard for an equaliser, Reading should have stretched their lead on the break. Button saved well from Swift, McCleary struck the bar with a fierce 20-yard drive and Button also dived acrobatically to keep out another McCleary attempt. Fulham won their ninth penalty of the season in the 89th minute but, for the seventh time, they missed from the spot. Martin also failed in the 1-1 draw at Queens Park Rangers on Saturday.